Abiomed offers a niche product to a market that is experiencing phenomenal growth metrics. Its product is an inelastic good, giving the company flexibility in pricing. The company is an innovators, and is able to leverage its strength in R&D to continue growing across the globe. It has a lean business model that requires little capital to operate. The world is getting older and sicker. The risk of heart disease has increased across the globe, with an OECD average heart disease mortality rate of 299 per 100,000 people. 39.6% of all American adults and 18.5% of all children are obese. The world is aging, and for the first time in US history, older people are projected to outnumber children. Older age and unhealthier behaviors can lead to a variety of health risks, especially for the heart. Right now, the number one risk of death when hospitalized is cardiogenic shock. 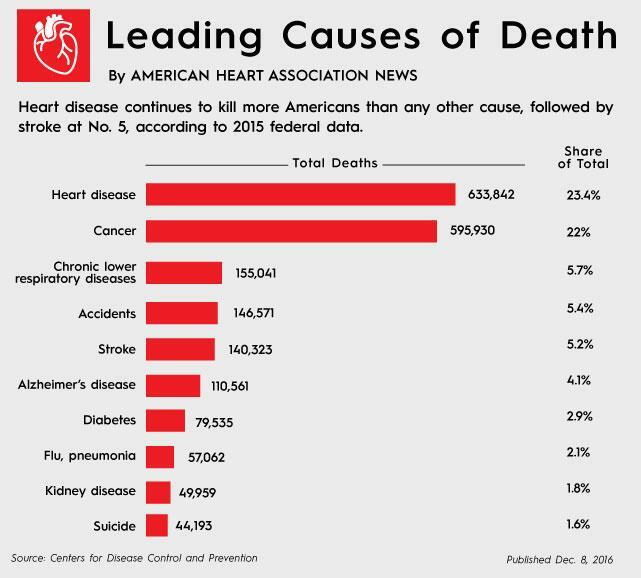 The number one cause of death in the US is heart failure. The top health expenditure is on heart conditions. This gives Abiomed (ABMD) plenty of market opportunity. Abiomed is a biotech company that specializes in post-heart attack and cardiogenic shock patients. It is currently the "leading provider of temporary mechanical circulatory support devices (heart pumps) in the United States." The company has an ultra-niche product line that caters to the growing population with heart problems. It has lots of opportunity to capitalize, as heart disease continues to be the number one killer among both men and women. Abiomed is also continuously building out its product portfolio, with intense focus on innovation to boost its overall market penetration. Finally, the company's business model is relatively lean and requires little capital to operate. The company has a growing product portfolio, currently composed of 7 pumps, including the Impella 2.5, the Impella CP, the Impella 5.0 and the Impella RP. Abiomed recently released a trial of the Impella Connect to 36 U.S. hospitals to provide real-time monitoring of patients with Impella support. Impella Connect is also connected to Abiomed's 24x7 Clinical Support Center, which allows the company's staff to communicate directly with medical professionals. Right now, the company has 311 pending patents and 317 total patents. It has increased the number of patents pending by 29%, and has increased the total number of patents by 15.7% into 2018. It has also expanded the number of publications by almost 15% Y/Y, furthering cementing its focus on research & development. For Abiomed's Impella product alone, the company has increased its revenue by 35% Y/Y and has expanded by almost 60 sites. It continues to grow across the globe, and received approval for expansion in India back in July 2018. Abiomed received European approval for the Impella 5.5 in April 2018, receiving the CE marking, which is the European Economic Area stamp of approval. The company has had strong success in Germany, and also received regulatory approval in Japan. 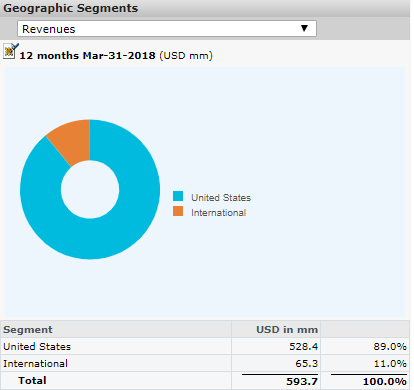 Right now, only 11% of its revenue comes from overseas, but that's 63% growth from 2017 numbers. The company has a big opportunity to continue expanding abroad and achieving further market penetration in key markets. 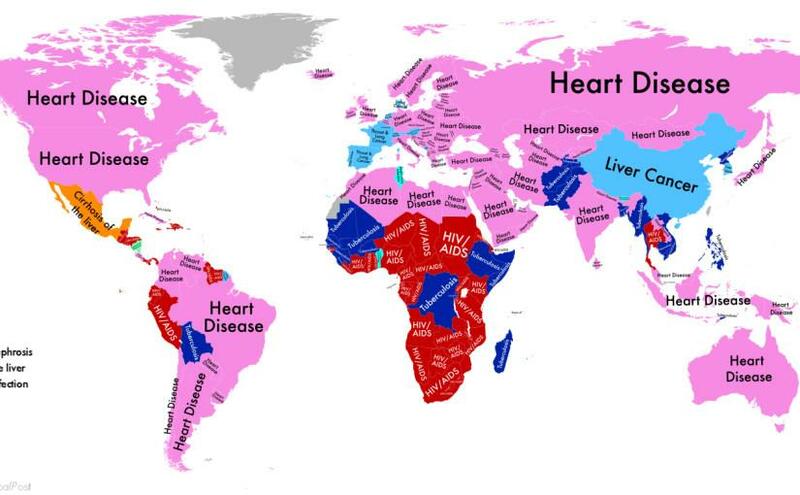 The image below details the number of countries with heart disease as the number one killer. Thus, it also doubles up as an image of Abiomed's future market opportunity. Abiomed does have growth headwinds, including an FDA investigation on its Impella RP System. The company uses the Impella RP for right-side heart failure, and it is the only device cleared by the FDA for that purpose. It has achieved 73.3% survival rates in previous clinical studies. However, in the post-approval study (PAS) that the FDA is investigating, only 17.4% of patients survived. In the clinical studies prior to this study, there were "strict inclusion and exclusion criteria". In the PAS, there is a strong potential that patients who were not suitable for the device received treatment, as 70% of the patients in the study would not have met the previous criteria for selection. Abiomed did a follow-up study, this time with "Recover Right" patients that might meet the criteria, and had a survival rate of 64%. That bodes well for the company's future growth prospects, and should quell some investor concerns about the FDA investigation. So, where does Abiomed go from here? For Q219, the company had Y/Y revenue growth of 37% and a 104% increase in net income. Impella heart pump revenue alone increased 67% across the globe and 34% in the US. The company has a gross margin of 83.6%, giving it plenty of room for pushing its prices down, if management deems that necessary. However, it does have a relatively inelastic good, so the pricing model can be as flexible as the company needs it to be, which is a competitive advantage. Abiomed currently carries no debt, giving it plenty of room to leverage for future innovation. It has a strong cash position, with 26.5% Y/Y growth in cash and cash equivalents. It has experienced substantial increases in operating cash flows, posting 23.7% Y/Y growth and a 76.7% 3-year CAGR. Abiomed has experienced strong increases in free cash flow with 56.6% Y/Y growth from 2017 and a 58.6% 3-year CAGR. It has a strong credit health panel due to its lack of debt. Abiomed also has strong profitability metrics, strong margins, and is extremely liquid, carrying a current ratio of 6.76 and a quick ratio of 5.88. 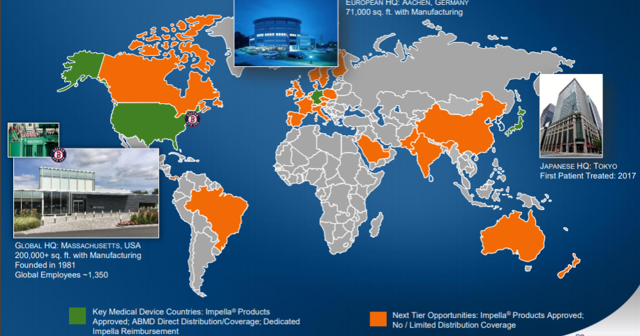 The company has multiple opportunities to expand abroad, especially in developed nations. It also doesn't have much in terms of marketing or online advertising channels, so that represents another opportunity for it to continue to grow. The company also has three key products in the pipeline that will aid in its business development. 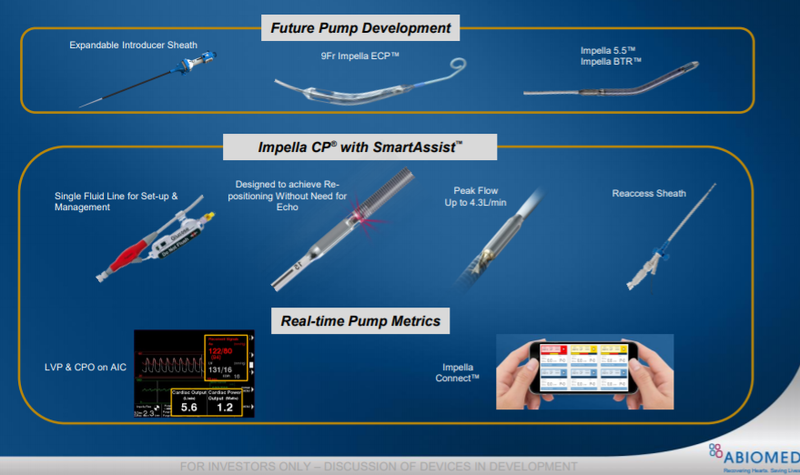 The Impella 5.5 is a heart pump that has motions and sensors, and recently received CE approval from the EU. The Impella BTR is a longer-wear version of the 5.5, expected to last for up to one year versus the 5.5's "months" time frame. The Impella ECP is larger-scale pump with an expandable inflow into the left ventricle. SmartAssist will also prove to be a key area of growth for the company, allowing it to grow its customer base and run operations more efficiently. Right now, it only has a 10% penetration with its percutaneous coronary intervention (PCI) and a 10% penetration of the AMI Cardiogenic shock market. That leaves plenty of room for further penetration in both of those markets. The company also has a potential market in Japan, with a penetration rate that is currently less than 1%. Abiomed's Total Available Market should continue to grow over time, especially as the number of patients increase in the PCI market due to an overall increase in coronary artery disease and the overall growth in health issues. There are also several opportunities for the company to expand into "myocarditis, peripartum cardiomyopathy, postpartum cardiomyopathy, and spontaneous coronary artery dissection", increasing the TAM by +10,000 each year. It is no secret that Abiomed is expensively traded. The company has a 54.79 trailing P/E and a 60.9 Forward P/E, so that valuation isn't compressing in the next year. However, that's expected for this industry. Biotech is not cheap. Abiomed is the smallest of its peers in terms of market capitalization, and trades right around the average valuation for the group. Veeva Systems (VEEV) is the most expensive company out of the group, but Abiomed is close behind in most metrics. However, Abiomed is worth the premium that it is currently trading at. When you compare Abiomed's profitability metrics to those of its peer group, Abiomed is the winner in almost every category and outperforms the average in each metric. It has the highest gross margin, leading the pack by 8.3%, coupled with strong margins across the board. The company also outperforms in return on equity, return on assets, and return on total capital. Abiomed has also had incredibly strong growth in its financials, with the CAGRs to prove it. 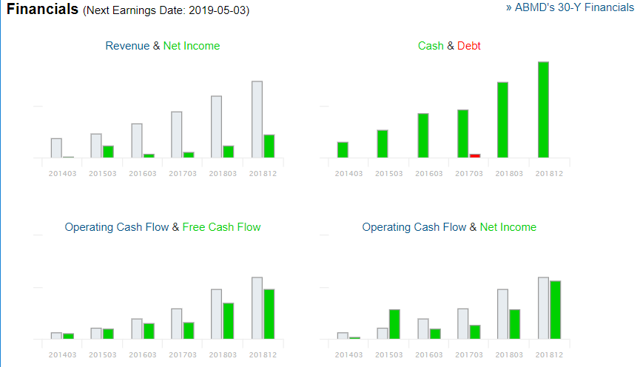 The company has experienced growth in revenues and net income, and substantial increases in free cash flow, especially compared to its peer group. It has had some of the strongest growth across the board, and outperforms across multiple profitability metrics. But on a share price basis, the company has struggled, posting a negative 1-year performance, YTD performance, and 1-month and 3-month performances. That's in the face of outperformance of the peer group, with VEEV posting a 14.36% 1-month return alone. The combination of strong profitability and margins, as well as recent underperformance, means the stock has lots of room to grow. Based on my DCF calculations, ABMD has a potential upside of 65% at the current stock price of $270. 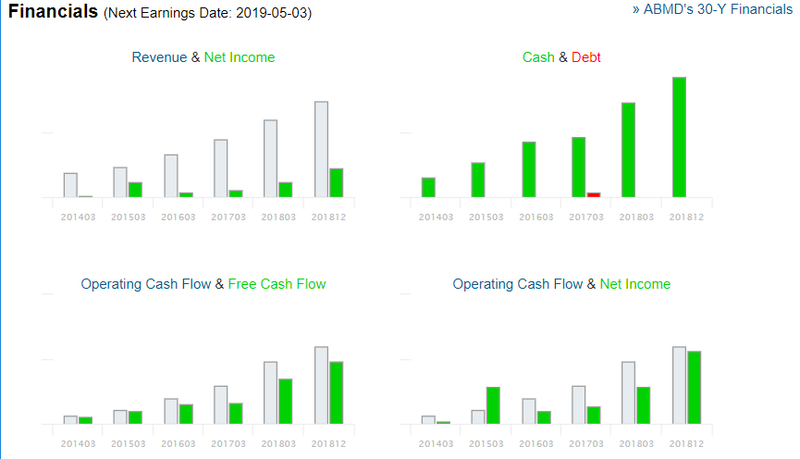 It has an expected growth rate of 6.98%, based on my calculation of an expected return on invested capital and retention ratio, and carries a weighted average cost of capital of 10.5%. On the low end, the stock has potential of a 24% return and a high-end potential of 51% return. 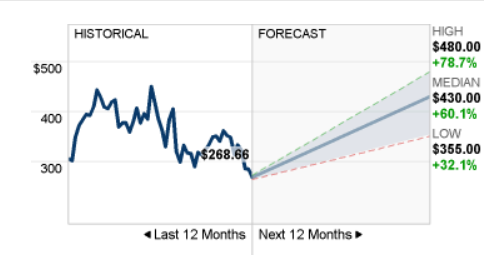 This is relatively in line with what analysts are predicting for the stocks, with a median of $430 and a low of $355. Abiomed's product portfolio is promising, and due to the company's underperformance this year, it has quite a bit of room to trend upwards. It doesn't have any direct competitors, and is the only company to produce a product for the right side of the heart. As the population ages, heart failure becomes more and more of an issue, which gives Abiomed more opportunity to grow. It does have a high valuation, but based on intrinsic value calculations and forecasts, there is room to the upside.